Setting a NEW Standard in the industry, only one controller is needed to satisfy today’s Building Automation protocols. Smart Controls’ new MP series controllers can connect to Native BACnet® and LonTalk® simultaneously. The Smart I/O™ SC160-MP breaks the multi-protocol communication barrier by providing NATIVE BACnet, and LonTalk communication all in one controller. BACnet can communicate over an RS-485 communication channel while BACnet/Free Topology and LonTalk/FT (Free Topology) are communicating over a TP/FT-10 communication channel simultaneously to provide monitoring, control and diagnostic information. In addition, the SC160-MP has the capability to communicate BACnet/IP or LonTalk/IP in a manner that is transparent to both the application and FT network. With BACnet/IP, applications on the SC160-MP run unmodified over a very reliable Free Topology channel delivering BACnet Objects. With LonTalk/IP, applications on the SC160-MP run unmodified over the same reliable Free Topology channel delivering network and configuration variables. The IP address is established at the device level. The SC160-MP is fully compatible and discoverable using industry standard, BTL certified, BACnet management clients and LONWORKS® network management software. The SC160-MP is a fully programmable controller allowing a complete sequence of customized operations for today’s ever-changing control strategies that are required to meet continued energy efficiency requirements. The reliable cost effective I/O is continuously monitored and precisely controlled by an on-board 32-bit microprocessor. The controller features an additional local serial communication to a Smart Controls SI-20 remote room sensor interface. The SI-20 features a fully programmable display for unprecedented custom application functionality. As an option, a precision airflow sensor can be added that provides reliable and accurate measurements expanding the superior performance of the SC160-MP for Pressure Independent VAV applications or static pressure applications under 2 inches WC (0-500 Pa). The six universal inputs (UI) can be software selected to sense analog or digital signals. There are no jumper adjustments or settings on the SC160. Inputs are automatically set-up in the application program that is downloaded into the controller. An analog signal from a resistive (10K ohm Type 2, 3 or 20K ohm) type sensor, voltages (0-5V, 0-10V) or current (4-20mA) from a transducer are accurately measured with a resolution of 12 bits. A digital input signal from a dry contact or 0-5V volt source is used to provide the status or state of external devices. A +20 VDC source is available to provide power for external transducers and is protected by an internal auto-resetable fuse. No external DC power supplies are required for your 4-20ma Loop Powered sensors. The Six digital outputs (DO) are voltage sourcing Triac outputs for control of on/off or pulsed controlled external devices where the current does not exceed 1A at 24 VAC. 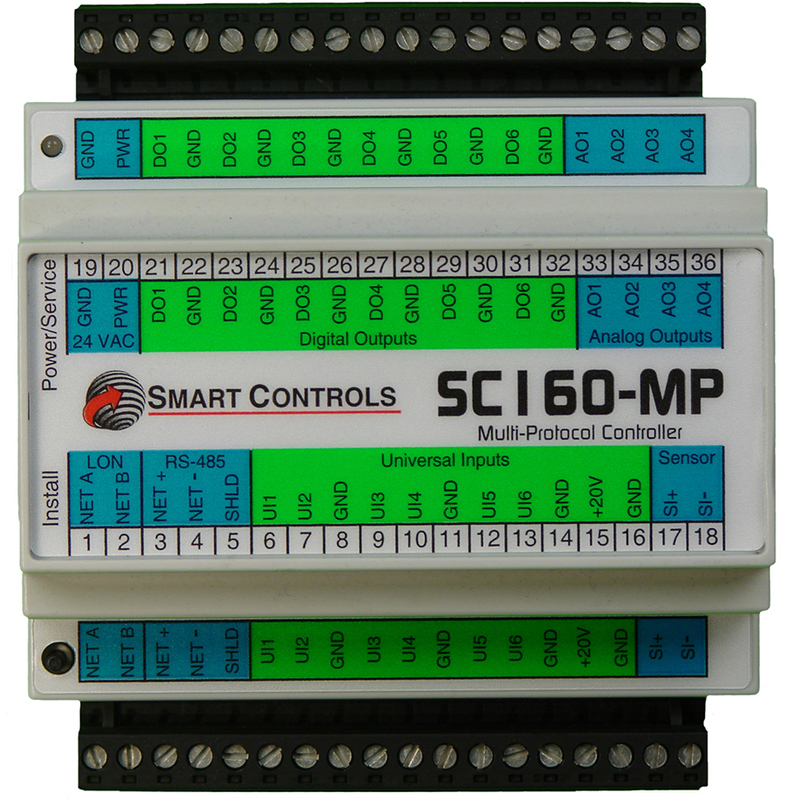 The SC160-MP controller is protected from reverse power supply input wiring, over-voltages, transients, and other common events that can damage unprotected inputs and outputs. Continuing the commitment to OPEN Controls, Smart Controls controllers can be programmed by multiple software packages available in the industry. User defined algorithms and functions can be programmed using VisualControl™, NodeBuilder®, LonBuilder® or other third party LONWORKS programming tools. The application program is stored in non-volatile memory allowing the application to be retained even after loss of power. The versatile I/O allows numerous applications to be developed and implemented with the SC160-MP. The enclosure snaps securely onto a 35mm DIN-rail for quick and easy mounting. A spring-loaded locking clip allows for quick and easy removal. The wide operating temperature range, -20 to 70 °C, makes the SC160-MP well suited for many demanding applications.